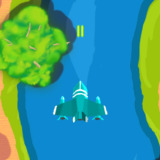 Enjoy this frantic battle in the sky. Shoot down enemy spacecrafts while surviving as long as you can. Upgrade your ship, weapons and other skills and battle even bigger ships and bosses.